Amanda Arnold and I have crossed paths many times, but in the past couple of years, we have become super close! 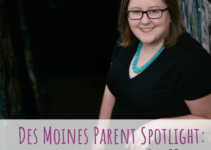 Amanda wears many hats including virtual assistant, sitting on the board for the Des Moines Children’s Museum and running a cloth diaper bank. 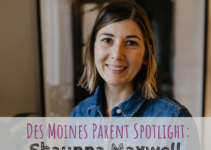 Des Moines Parent would not run as smoothly without the help of Amanda! She works behind the scenes to make sure content is scheduled, writes guests posts and other fun odds and ends. 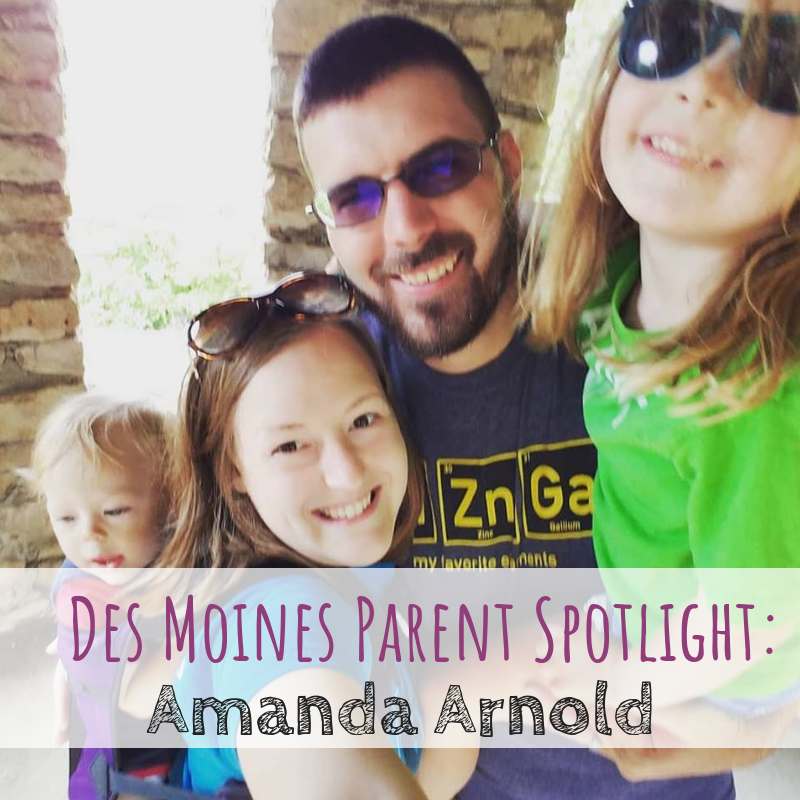 Learn more about Amanda’s jobs and what she loves in Des Moines, Iowa. I grew up on a farm in Western Iowa. I honestly never pictured myself living in a city. I attended Iowa State University where I majored in Animal Science. I met my husband, Mark, in the back row of a very boring English class. Some group projects, a few late nights in the library studying, and a couple of walleyball (volleyball in a racquetball court) games later–well the rest is history. I moved to Des Moines in 2012, shortly before Mark and I got married. We now own a house in the historic Beaverdale neighborhood. We both love Beaverdale because it gives us a sort of small-town feel, while still being in the city. We have two wild and crazy kiddos: Charlotte, age 4 and Thomas, age 18 months. During warm weather, the kids and I spend most of our spare time out and about traveling to parks. They could run from sunup to sundown, I swear! I run several different businesses. Firstly, in the evening hours (around my husband’s work schedule) I work as a virtual assistant. I do social media management, marketing, and general administrative tasks for local small business owners. 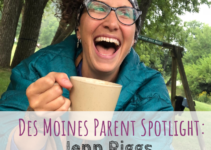 I also sit on the Board of Directors for the Des Moines Children’s Museum. 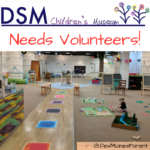 You can find me– and usually my kids– working the front desk at the Museum a couple of days a week. Lastly, in my “spare” time I run a cloth diaper bank for low-income families in the Des Moines area. Families with babies or toddlers can apply to receive a stash of cloth diapers that they can use until their child is potty trained or turns 3, whichever comes first. I started my virtual assistant business over a year ago. I had been doing social media management for several nonprofits in a volunteer capacity for over a year at that point. My husband and I were starting to get really serious about becoming debt free. I wanted to add to our family’s income, while still maintaining the flexibility I had with the kids. So I took a giant leap of faith and started reaching out to business owners I knew, asking if I could make their lives a little easier by helping out with social media and general administrative tasks. My leap of faith paid off big time, and our family has been able to make HUGE strides in our debt free journey because of it. That’s easy! 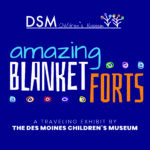 The Des Moines Children’s Museum!! 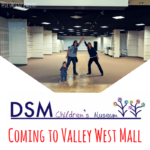 We also love Valley Community Center, Franklin Library, and the Clive Public Library, too! Oh, this is a hard one!! There are so many parks we love! I would have to say our top 5 would be Ashby Park in Beaverdale, Jester Park, Valley Community Center playground, Miracle Park in Ankeny, and Ashley Oakland Park. As you probably can tell, we aren’t afraid to jump in the car and drive in order to test out an amazing new park. One of our favorite date nights is dinner out and then catching a show at the Funny Bone. For a girls night out, I love going to make and take a workshop. So far my favorite is the Knotty Nail! Find a way to keep track of everything that works for you. For me, I have a giant planner that I write everything in. Everything is color coded with different colored pens. Always keep a bag with two extra diapers, wipes, and a couple of snacks in the trunk of your car–separate from the diaper bag. This has saved us several times since we added the second kiddo to our family.